Why don't more people make brownies from scratch? I know that making them from the box seems like the simplest option and I know that they come out pretty good that way too, but the made-from-scratch variety taste so much better and are just as ridiculously easy to make. 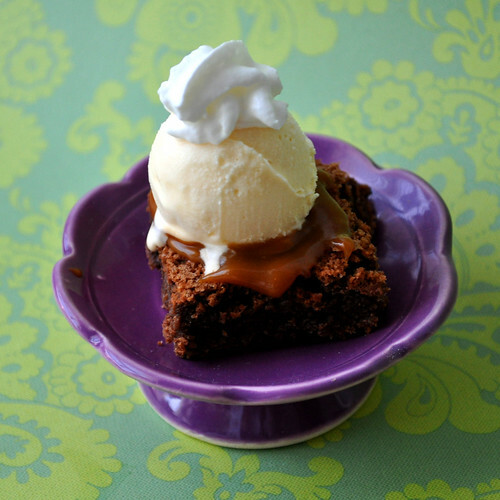 To accompany my recent ice cream making flurry, I decided to make a homemade caramel sauce and brownies. If you did not heed my advice earlier, the caramel sauce alone is reason to run out and buy David Lebovitz's book, The Perfect Scoop. It's rich and luscious and complex...and when I was done, I could have bathed in it, it looked so good. But I digress, this post is about the brownies. A one pot recipe that yields a pan of rich and fudgy brownies that were almost inhaled on sight, but are even better with toppings. A drizzle of caramel and a bit of whipped cream is nice, but slip in a scoop of vanilla ice cream, and maybe a pretzel, and the combination is to die for. I brought the brownies, a tub of ice cream, a jar of caramel, a can of whipped cream and a bag of pretzels to work and told my coworkers to go nuts...there wasn't a crumb left at the end of the day and the jar of caramel was licked clean. They really are that good. Note: I doubled the recipe because making only a dozen brownies seemed sad and I wanted a full 9x12 pan of these guys. Feel free to halve the recipe if you prefer. Preheat the oven to 350°F. Line the inside of a 9x12 inch pan with 2 lengths of foil, positioning the sheets perpendicular to each other and allowing the excess to extend beyond the edges of the pan. Or, use one large sheet of extrawide foil or parchment paper. Lightly grease the foil or parchment with butter or nonstick cooking spray. In a medium saucepan, melt the butter, then add the chocolate and stir over low heat until the chocolate is melted and smooth. Remove from the heat and stir in the sugar and vanilla until combined. Beat in the eggs one at a time. Add the flour and stir energetically for 1 full minute, until the batter loses its graininess, becomes smooth and glossy, and pulls away a bit from the sides of the saucepan. Stir in the chopped nuts or chocolate chips. Scrape the batter into the prepared pan and bake until the center feels almost set, about 35 minutes (30 min if you're halving the recipe). Don’t overbake. Let cool completely in the pan before lifting out the foil or parchment to remove the brownies. Storage: These brownies will keep well for up to 4 days and can be frozen for 1 month. Those brownies look divine. I agree- only twelve brownies is just a tease. If I made this and took it to work, I'd have to step aside lest I be run over! 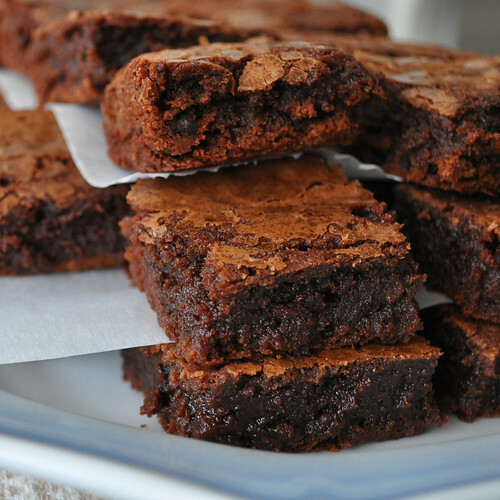 Thanks for the lovely brownie recipe and photo! 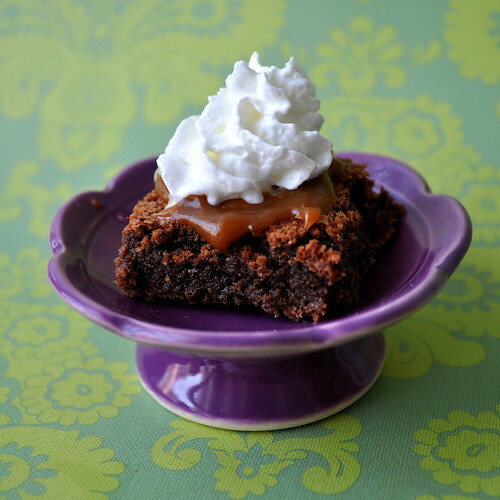 Oh my goodness, these brownies look amazing, especially with that caramel sauce. 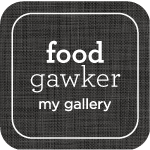 Adding this to my recipes-to-make-as-soon-as-possible list. Thank you, they were fantastic. I'm rarely able to turn down brownie a la mode if it's on a menu! And now I'm wanting to try brownies with pieces of broke pretzels mixed in. I, too, love that salty-sweet combo! Those look absolutely incredible! Have you ever tried white chocolate brownies? They're the best! Oh my gosh, I'm sorry about that. It's supposed to say 12 Tbsp unsalted butter. I fixed it. Good luck!